Mummy berry is one of the most serious diseases of blueberry. Once the disease becomes established in a planting, it can destroy most of the crop. Losses result from rotted berries and[' killed or blighted blossoms and young shoots. Blighting of new shoot tips and blossoms can be easily mistaken for frost damage. By blossom time, infected young leaves and shoots wilt, turn brown, and die. Infected shoots may also resemble a shepherd's crook. About a week after infection of early new growth, dead areas develop on petioles, along the midrib and veins of leaves, and at the base of flowers. These blighted tissues often senesce and drop to the ground. Berries that develop from infected flowers may attain nearly full size before turning pink, tan, or gray and shriveling into hard mummies (figure 1), many of which drop to the ground at or before harvest. Young infected berries that appear healthy and green may be cut open to expose spongy white fungal growth in the seed area (figure 2). Eventually, the fungus fills the entire berry, and the outer skin falls off, forming a mummy. Mummies at this stage look like miniature black pumpkins (figure 3). Figure 1. Shriveled blueberry fruits ("mummies") caused by mummy berry disease. Courtesy of J. Pscheidt, Oregon State University, used with permission. Figure 2. Spongy white fungal growth inside an immature infected berry (top left) compared to seeds forming within an immature healthy berry (bottom right). Courtesy of J. Pscheidt, Oregon State University, used with permission. Figure 3. After the outer skin of mummified berries falls off, the berries look like miniature black pumpkins. Courtesy of A. Schilder, Michigan State University, used with permission. Figure 4. Apothecia of Monilinia vaccinii-corymbosi on top mummified berries. Mummy berry is caused by the fungus Monilinia vaccinii-corymbosi. The fungus overwinters in shriveled mummies on the ground. 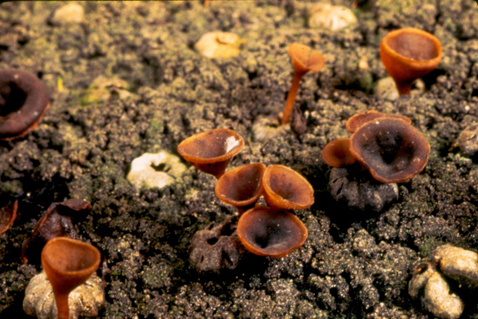 In early spring, cup- or globe-shaped structures of the fungus called apothecia (figure 4) are produced on mummified berries during cool rainy periods. Spores produced inside apothecia are released into the air and carried by wind to young developing leaves, shoots, and flowers where they cause primary infections. If moisture is not present, the fungus will not produce spores. However, the fungus may survive in mummies for one year or more. Another type of fungal spore (conidia) is produced in powdery gray-tan masses on dead tissue that results from primary infections. These conidia are spread during bloom by wind and insects and result in secondary infection of flowers. Fruit that develops from infected flowers turns into mummies and falls to the ground. Figure 5. Disease cycle of mummy berry. We wish to thank the New York State Agricultural Experiment Station for use of this figure. Taken from Small Fruit Crop IPM Disease Identification Sheet No. 3. Removing mummified berries from the planting will greatly aid in controlling the disease. Removing these berries is not practical on a commercial scale, but may be of value in backyard plantings where there are fewer plants. After removing mummies, destroy or bury them. Cultivation in early spring to disturb or cover the mummies has been reported to be effective. Mummies that are disturbed or covered with soil at this time remain dormant or do not produce spores. Cultivating between rows and raking under plants to disturb or cover mummies should be done as early as possible in the spring and repeated after each hard rain until after bloom. If just a few mummies are missed, they can produce enough spores to infect the planting. The use of resistant cultivars can help control mummy berry, and several resistant cultivars are available, including Duke, Elliott, Lateblue, and Northsky. For a list of cultivars commonly grown in the Midwest with resistance to mummy berry or other diseases, consult Bulletin 861, Midwest Small Fruit Pest Management Handbook. Where mummy berry is a problem, a good fungicide spray program is essential. For the most current spray recommendations, commercial growers are referred to Bulletin 506-B2, Midwest Commercial Small Fruit and Grape Spray Guide, and backyard growers are referred to Bulletin 780, Controlling Diseases and Insects in Home Fruit Plantings. These publications can be obtained from your local OSU Extension office or OSU Extension's online bookstore at estore.osu-extension.org. This fact sheet was originally published in 2011.